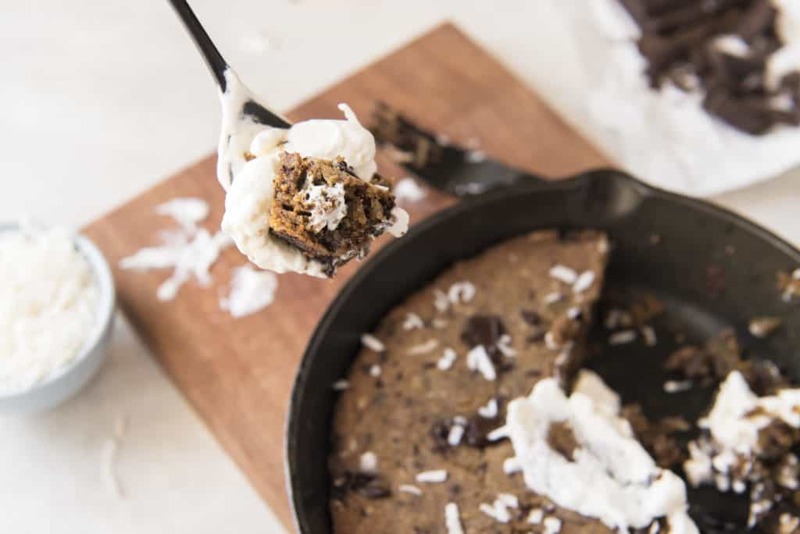 If you love keto cookies then you will love this keto chocolate chip coconut skillet keto blondies recipe. These low carb blondies taste like a chocolate chip cookie, but embrace the texture of an ooey-gooey brownie. What Exactly Is A Blondie? So, blondies are kind of like a brownie except they are missing cocoa powder. Other’s might say it’s a cookie in a bar form. Some blondies have a butterscotch flavor mostly due to the brown sugar, but since this recipe does not use brown sugar, we decided to flavor ours with vanilla and a little bit of almond extract. Feel free to play around with the extract flavors and let us know what you think by tagging us on Instagram as you devour this crazy decadent dessert! Just as a warning, you should make sure you have friends to share this with - the calories can add up! Other Classic Low Carb Dessert Recipes You May Enjoy! If this is your first time visiting our blog, you need to check out our Chewy Chocolate Chip Cookies and our Keto Fudgy Brownies. They’re super tasty and are great keto desserts to replace higher carb versions. If you’re more of a pie person, then our low carb coconut cream pie is just what you need. These keto congo bars are made with coconut flour and almond butter as the low carb base. Whereas, traditional congo bars are made with flour and brown sugar. 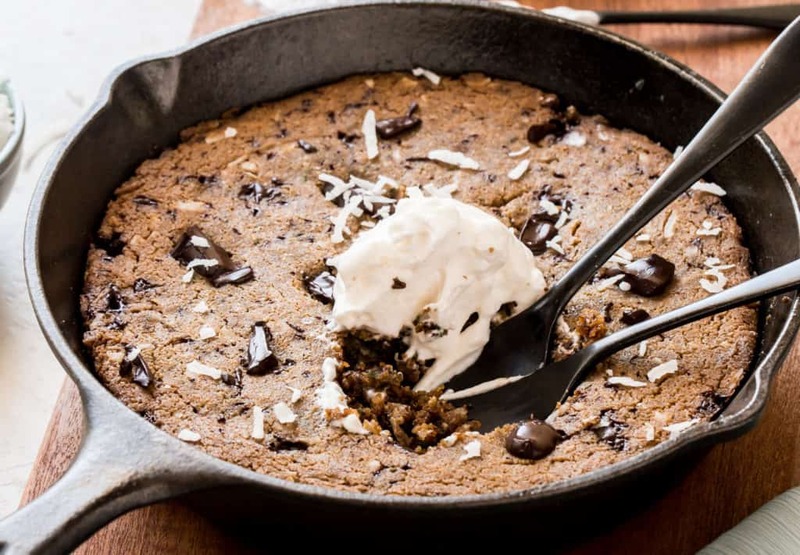 These rich and delicious skillet blondies are what dreams are made of so if you have the ingredients on hand and a craving for something sweet, drop everything and make this now! 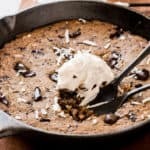 Recipe can be quickly added to MyFitnessPal - Search "KetoConnect - Keto Blondies"
Preheat oven to 350 degrees F. Grease an 8-inch cast iron skillet with oil of choice; set aside. In a small bowl whisk together erythritol, coconut flour, and salt. Set aside. In a second larger bowl, whisk together eggs, almond butter, melted cacao butter, stevia, and extracts. Stir in the dry dry ingredients and mix until combined. Fold in coconut and chocolate chunks. Transfer the batter to the prepared skillet and spread in an even layer. Bake for 20 minutes, until lightly golden brown. Allow to cool for 10-15 minutes prior to serving. Best stored in the fridge in a zip top bag.